For other uses, see Paulista (disambiguation). 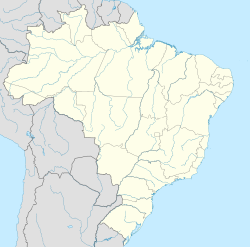 Paulista is a municipality in Pernambuco, Brazil, with a population  of 303,404 as of 2011. It has the highest Human Development Index (HDI) of the Recife metropolitan area. It is the birthplace of footballer Rivaldo, and is also famous for its beaches, including Maria Farinha with the giant Veneza water park. It was incorporated as city in 1935. The land on which the city is built was sold to a bandeirante from São Paulo in 1689, whence the city's name. Conceição Beach - At 2 km (1.2 mi) long with many coconut trees, this beach has calm and very deep water. Also has many bars and tents. Maria Farinha Beach - features quiet and shallow waters. At low tide, it is possible to see the reefs, and at this time, the beach has almost no waves. Pau Amarelo Beach - features quiet water and a formation of sand banks, which give rise to small sandbar islets and natural pools. The main economic activities in Paulista are based in commerce, tourism and textile industry. ^ "Estimativas aa População Residente nos Municípios Brasileiros com Data de Referência em 1º de Julho de 2011" [Estimated Resident Population of Brazilian Municipalities with Date Reference of July 1, 2011] (PDF). ibge.gov.br (in Portuguese). Instituto Brasileiro de Geografia e Estatística [Brazilian Institute of Geography and Statistics] (IGBE). 2011. Retrieved September 7, 2016. This Pernambuco, Brazil location article is a stub. You can help Wikipedia by expanding it. This page was last edited on 6 March 2019, at 21:38 (UTC).